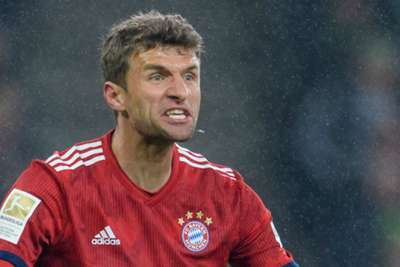 Thomas Muller says he would deliberately miss a penalty if Bayern Munich were awarded one like Fortuna Dusseldorf's in their Bundesliga clash on Sunday. Bayern were 3-0 up thanks to a brace from Kingsley Coman and a Serge Gnabry strike when Mats Hummels was penalised for handball inside the area following a VAR review. Substitute Dodi Lukebakio stroked home the resulting spot-kick in the 89th minute, but Muller insists he would have purposely missed had the Bavarian giants been awarded a penalty in the same circumstances. "Of course, the ball clearly hits the hand. I don't know how the rest of Germany sees it, but as a striker I would not want a penalty like that for us. I would deliberately miss it," he told Sky. Fortuna coach Friedhelm Funkel, however, disagreed with Muller's assessment. He said: "We have had to accept a penalty for less, so it was a crystal-clear penalty for me, which of course does not change the deserved victory for Bayern Munich." Leon Goretzka struck in stoppage time to seal a 4-1 win that lifted Bayern one point above Borussia Dortmund at the Bundesliga summit with five games remaining. Muller admitted the reigning champions are feeling the pressure of such a close title race. "We always have pressure and we have to deliver," he added. "It does not hurt us if we have a bit of pressure. "This is how we have to go on. Dortmund are currently not brilliant, but they are delivering the results and that puts us under pressure. "We have it in our own hands, so we have to play it game by game. We want to win all the remaining games." Bayern confirmed on Sunday that Manuel Neuer, who limped off in the second half with another calf injury, will be out for two weeks and Mats Hummels will "take a short break from training" after straining his thigh. Mercedes duo Lewis Hamilton and Valtteri Bottas are chasing a fourth straight one-two as the Formula One paddock arrives in Azerbaijan.